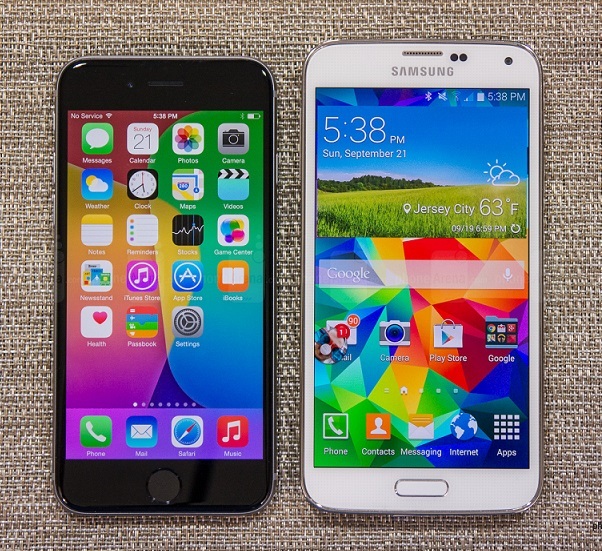 iPhone 6 vs Galaxy S5 - Which Will Get Things Done Faster? Both the leading smartphones of 2014, the Apple iPhone 6 and the Samsung Galaxy S5, are packed with high-end specs. Featuring improved processing chips and accompanying hardware, the gadgets are at best to give you some breezy performance and improved user experience. However, there are always some differences in the way both these gadgets behave, let’s see which one wins in the game of speed. The difference in the end performance is both due to the hardware and software. Apple uses a very closed and controlled software inside the iPhone. This gives the company a complete control over how the different aspects of the OS will work and function together. However, Android has remained the leading mobile OS thanks to open existence and the possibilities of having varied tasks done for free and more beautifully as it makes easier for users to find ways to get their smartphone work just like they want it to. Both these smartphones are also packed with some strong processors with Samsung often taking the lead with fitting the most latest processing technology inside. However, that has never left iPhone performance any behind thanks to its unique design that makes the hardware and software work in beautiful coherence. The question then remains, which one of these exactly gives the best performance. Is iPhone 6 more quick or does Galaxy S5 take the lead when it comes to speed? Folks at Phone Arena have put together a helpful video putting the iPhone 6 and Samsung Galaxy S5 side by side. This video lets you see where the Galaxy S5 wins and which tasks iPhone 6 is better at. It starts with, of course, booting up both the devices where Samsung Galaxy S5 wins by clearly booting up a lot quicker than iPhone 6. However, iPhone 6 takes the lead when it comes to core operations like accessing Contacts or Galleries; Galaxy S5 looks a little faster with third-party apps. The differences between the performance of both these smartphones isn’t quite a major one. Some operations seem to have negligible difference while others are a little noticeably slower.